The 4×4 navigator limousine hire combines a sophisticated feminine look with a stylized masculine feel, making it a perfect Wedding vehicle. The exterior is a stunning blend of a traditional Limousine and a 4×4 design, giving the Navigator a captivating charm that will leave all the onlookers spellbound. The artistically curved ceiling lights complement the ostentatious mirrors along the luxuriously cushioned leather seats. The seating area accommodates up to 14 people and also provides room to stretch out and relax with utmost comfort. 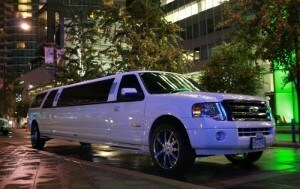 The exquisite build-in bar with beautifully patterned crystal glasses adds to the dramatic aesthetic feel of the Limo. Along with a spectacular design, the Limousine also provides a variety of entertainment options to indulge you during the ride. You can lay back and play your favourite movie on the TV, or listen to the music of your choice. The window divider gives you complete privacy, while also making sure that the driver is always within your reach through the intercom. The immaculate and graceful interiors of the navigator limousine hire will make you feel nothing less than a red carpet celebrity. Pamper yourself on your special wedding day by riding in this magnificent vehicle to emphasize the importance of the event and yourself!